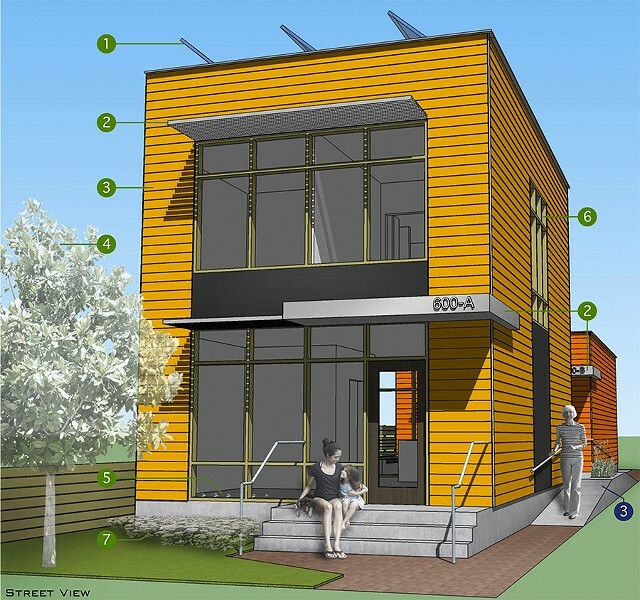 Could a design contest help replenish Chicago’s affordable housing stock? Those iconic, boxy beauties known as Chicago bungalows were the starter homes for a generation of immigrants looking to begin a new life in the city. The brick houses were built in the early 1900s for a wood-wary Chicago still skittish of fire, and were designed to fit the city's standard lots and challenging winters. As the population boomed, bungalows were replicated tenfold because of their smart design and affordability. Where are their contemporary brethren? As the city's housing stock ages, construction costs rise, and the luxury market reaches new heights, it's no longer advantageous for developers to build starter homes. Housing options have grown scarce for many working families and young people looking to buy their first home. Subsidized housing is helpful but can't be the only option. So, how can you attempt to solve this problem and inspire architects to stretch construction dollars and design a new generation of starter homes? Start by giving them an incentive. The Chicago Housing Policy Task Force, a diverse group of affordable-housing organizations, created the Disruptive Design competition to address these challenges. 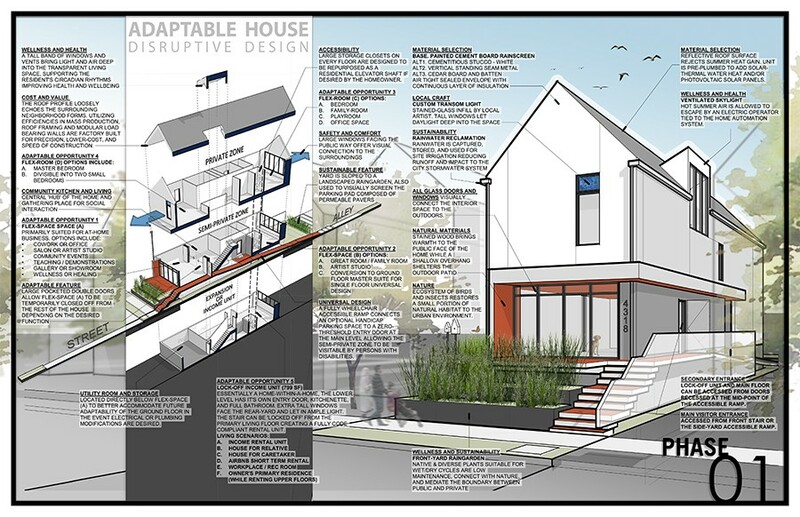 Architects, designers, students, and urban developers were invited to submit plans for an owner­-occupied, single-family home with a purchase price of $250,000. The winning design will be developed by Related Midwest—the company who's also behind mega-development "The 78"—on three vacant, city-owned lots in Bronzeville and West Humboldt Park. The task force is made up of representatives from Neighborhood Housing Services of Chicago, LISC Chicago, The American Institute of Architects Chicago, Northern Trust, and Chicago Neighborhood Initiatives. The group often focuses on addressing areas of regulation, taxes, and economic development with city and state officials, but this competition is another slice of their efforts to tackle affordable homeownership. "As Chicago continues to lose population, I think we have to ask ourselves why and how is housing a part of that?" says Sarah Brune, competition organizer and manager of innovation and public policy with NHS. "We want to make sure that working families are able to stay in Chicago and really have a stable and fulfilling life here. I think that giving them affordable and quality housing options is one way to do that." 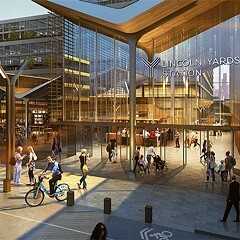 In early February, participants submitted preliminary design drawings and a written narrative detailing how the design addresses cost, sustainability, zoning, and wealth-­building components—i.e., as a live-work space or income unit. A jury of architecture experts will get feedback from Bronzeville and West Humboldt Park residents on the 130 entries received and choose three finalists who will each be given a $10,000 stipend to develop a much more detailed design. The finalists will submit proposals, along with another narrative describing how the community and expert feedback was incorporated. Finally, one winning design will be chosen to be built. The architect will be given a prize of $20,000 and will work with Related Midwest to make the design a reality. The competition will produce one winner, but the ambition is that all finalist entries could be realistic solutions for affordable homeownership and present innovations in live-work capabilities, construction materials and methods, accessibility, and opportunity for aging in place. "Hopefully these three finalists are really robust and something we can promote not just from this competition but in the future, something that can really be adapted and taken on," Brune says. "If we're not putting those starter homes in the stock today, what does that mean ten years down the road?" Chicago is a segregated city. Does centering this competition in Bronzeville and West Humboldt Park, both predominantly black and Hispanic, perpetuate this racial divide? Competition organizers said both neighborhoods are seeing a surge of development well above the price range of many first-time buyers and working-family residents. Third Ward alderman Pat Dowell wants to ensure these residents don't get pushed out as land value continues to increase. Owning a home provides security and a foothold for building generational wealth. "Equity in one's home and to be able to purchase a home in a community where the land is valuable for an affordable price provides you with a great opportunity," Dowell says. Bronzeville resident Valencia Hardy says she and the organization she works with, Housing Bronzeville, have been fighting the city for years to bring more affordable housing to the neighborhood, even submitting their own designs to both Alderman Dowell and Cook County Board President and mayoral candidate Toni Preckwinkle—and receiving no response. Hardy was surprised to hear about the contest, but doesn't think it will hurt the neighborhood. Her main concern is the $250,000 price point that she considers too high for working families in Bronzeville. "This is a black historical area," Hardy says. "It's not the point that we don't want to share. We just don't want to be priced out." With a higher concentration of vacant, city-owned lots, south- and west-side neighborhoods provided more opportunity. Brune hopes an affordable, accessible, and replicable design produced by this competition will help bridge the gap left from decades of disinvestment in these communities, and make affordable development more of a reality for neighborhoods throughout the city and Chicagoans in the future. Rarely do the winning plans in affordable housing design contests come to fruition or focus on single-family homes. 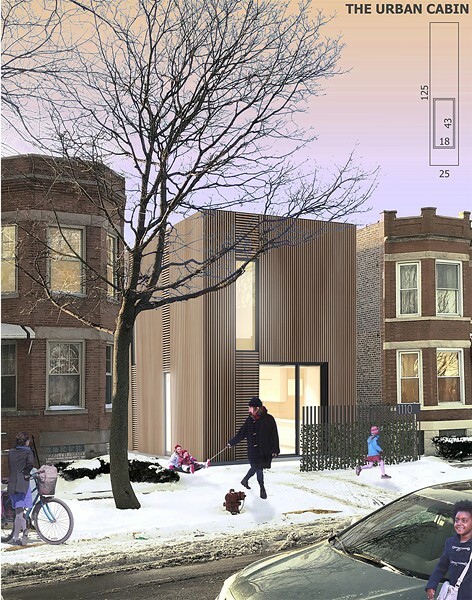 AIA has strong ties to the architecture community and experience with affordable housing in Chicago—their recent tiny homes design competition tackled the issue of homelessness in the LGBTQ community. Anjulie Rao, communications director of AIA (who has written for the Reader), hopes competitors will provide new perspectives on how the city can improve policy. "We're asking architects to look at Chicago's existing building code and global case studies where affordable housing is effective," Rao says. "What changes need to happen to Chicago's building code to make these projects feasible, more dynamic and more effective in housing people, building income and building a new type of wealth?" Related Midwest has already met opposition in Bronzeville as Alderman Dowell pushed back on proposed TIF district boundaries for The 78, which borders the Third Ward and is set to divert $1.1 billion in property tax proceeds. In the case of the design contest, the developer claims the focus is the desires of the community. "[Resident committee] input is going to be critically important to this, because at the end of the day it's the residents' community," says Don Biernacki, Related Midwest senior vice president of construction. "For too long some communities have felt alienated from the process." Hint: it doesn't involve helping low-income communities. 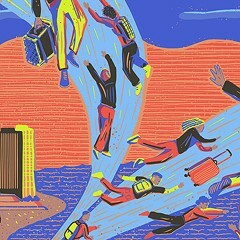 Black Chicagoans are leaving the city, and an unexamined history of racial discrimination may be to blame.